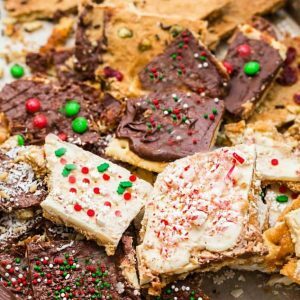 Christmas Cracker Toffee Candy with saltine and graham crackers decorated 7 different ways – the perfect easy baking project / handmade gifts for the holidays. Best of all, so easy to customize with as little as 4 ingredients! Plus video! Saltine Toffee – have you guys heard of it? 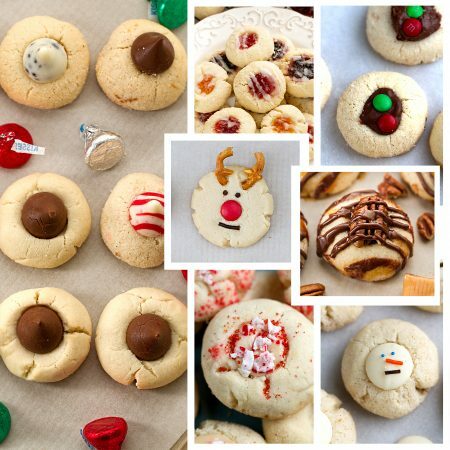 Also known as Christmas Crack and easily one of our favorite treats we make every year around the holidays. 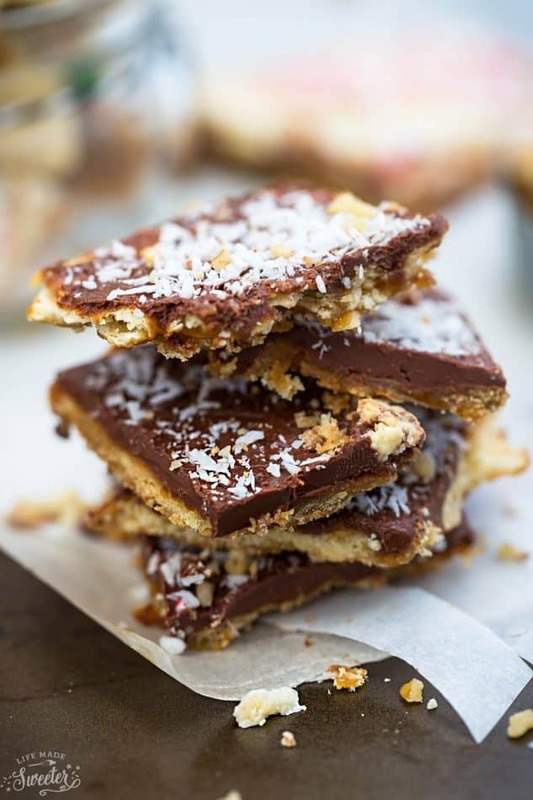 This popular Christmas candy is super addictive and usually made with saltine crackers covered in a layer of sweet toffee, and smothered in melted chocolate. There are tons of variations across the web — usually topped with chopped nuts, sprinkles, peanut butter – the possibilities are endless! 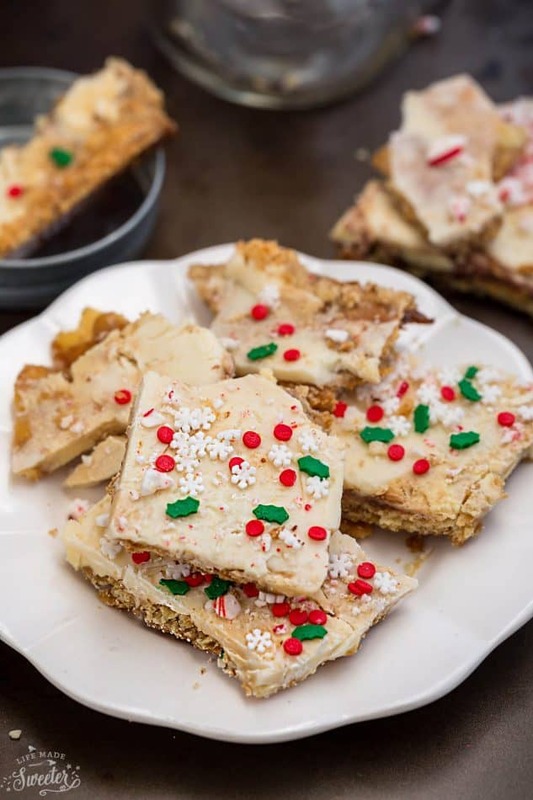 If your kids are home from school for the holidays, these toffee crackers make a super easy and fun baking project and I’ve got 7+ fun ways that you can decorate them! First, you’re going to line a large baking sheet with either parchment paper or foil sprayed with non-stick cooking spray. Then you arrange your crackers to fill up your baking sheet. You can use saltine crackers, graham crackers or use a mix of both like I did! Next comes the super simple 2 -ingredient toffee made with just unsalted butter and brown sugar. Bring the mixture to a boil and simmer then pour evenly over the crackers and pop the tray into the oven for 5 minutes until it bubbles. Remove from the oven and immediately sprinkle with chocolate chips. Butterscotch chips and cinnamon chips would be awesome too! Pop the tray back in the oven for another 90 seconds (for the chocolate to melt) then spread with an offset spatula. TOPPINGS – THE FUN PART!! White chocolate chips with crushed candy canes. 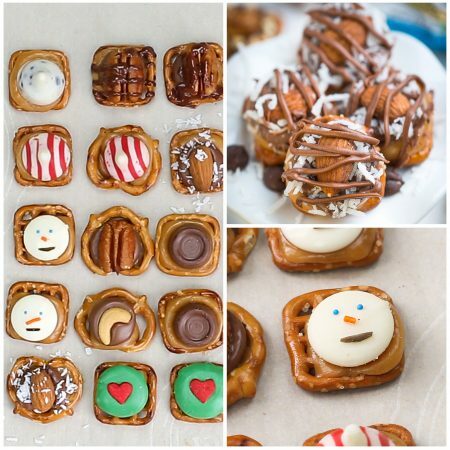 No matter which version you choose, these are one of the easiest holiday treats to make. As little as 4 ingredients and takes less than 15 minutes. 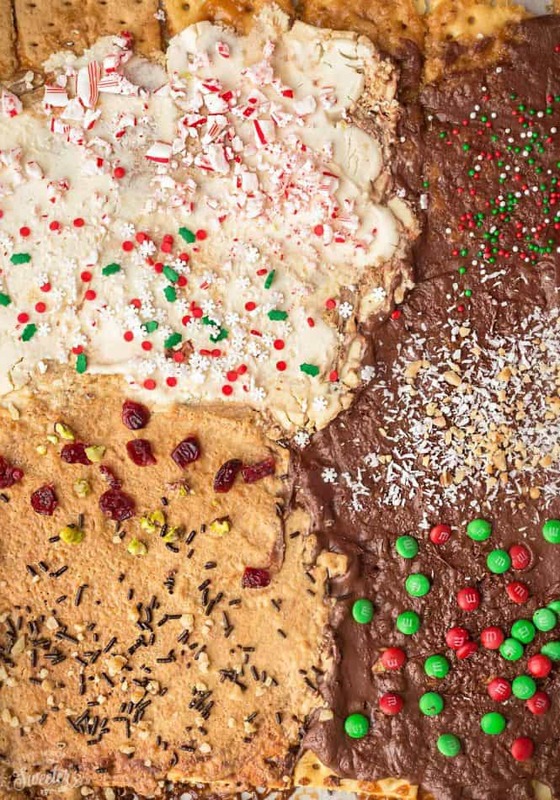 The decadent sweet and salty combination (<—Christmas crack) makes these impossible to stop at just one. Happy Holidays everyone!! 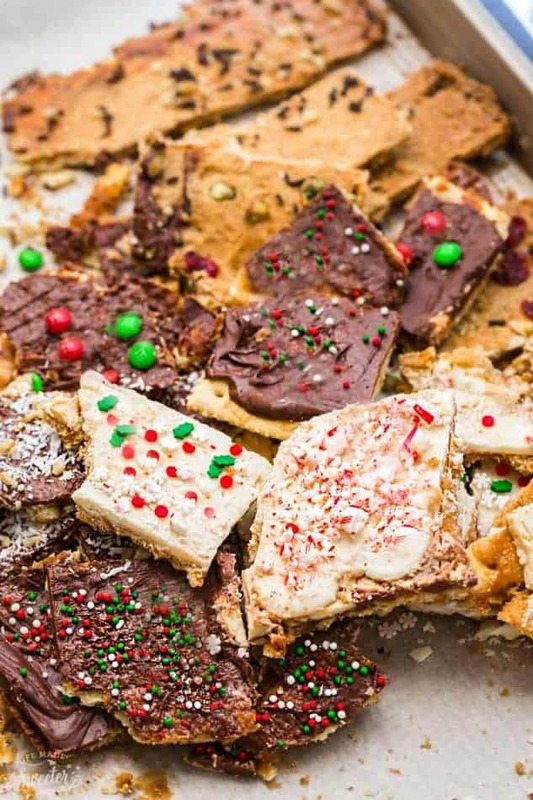 This cracker toffee is SO addicting and perfect for the holidays! Learn all the different ways you can make this simple recipe. Preheat oven to 350 degrees F. Line a 9×13-inch baking pan with parchment paper or foil, sprayed with non-stick cooking spray. Arrange the saltine crackers or graham crackers (or a mix like I did) in a single layer on the bottom of the prepared pan. Break the crackers if necessary to fit around the edges. In a medium heavy-bottomed saucepan over medium-heat, place the butter and brown sugar inside and bring to a boil, stirring occasionally. Allow to simmer and bubble up, without disturbing for 3 to 4 minutes (adjusting heat if necessary). Pour boiling toffee evenly over the crackers. Use an offset spatula to spread evenly over all of the crackers. Bake for 5-6 minutes, or until bubbling. Remove from the oven and immediately sprinkle the chocolate chips on top then return to the oven for another 90 seconds to help chocolate chips melt. Remove from the oven and spread the chocolate chips with an offset spatula into a smooth melted layer. Add toppings of your choice. Cool in the refrigerator for 1 hour or place in the freezer for 20 minutes, until the chocolate is set. Break into pieces and store in an airtight container at room temperature for up to 2 weeks. Ok I’m practically addicted to Christmas crack (that’s why it’s called that, right?) 🙂 so I’m LOVING these recipes, Kelly! I’ve only made one version before, so I can’t wait to try these out. That snickers version is calling my name! So many wonderful variations to choose from and they all look wonderful. Even if you just make this one thing for the holidays, you will feel right in the Christmas spirit! It does sound like a great thing to make with kids. I’ve heard of this but haven’t tried it yet…I hope I get to soon! Happy holidays to you and your family, Kelly! They all look amazingly festive and tempting! 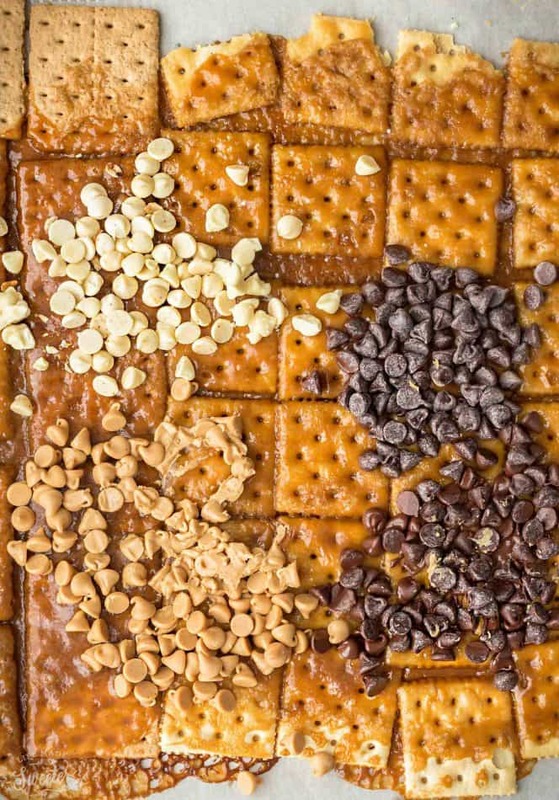 I need to get some peanut butter chips to try…have never seen them over here..
I’ve never made this saltine christmas crack before but everytime I see it I think about how I need to make it! I love sweet and salty together so I know I would love it! !